My wife, Tina Lenert, and I were recently invited to perform at a magic festival in Badalona, Spain, a suburb of Barcelona. It was not a magic convention, but rather a festival geared to the lay community. We did three shows in a beautiful, hundred-year-old theater and the sold-out audiences were great. Before leaving the States, I was told that this festival was honoring that great magician from the past – Chang. Upon hearing this, I was immediately transported back to age thirteen when I attended my first real magic show: Milt Larsen’s It’s Magic. The closing act was Chang – Latin America’s Greatest Magician. I thought it a bit odd that a festival in Spain would be honoring a Panamanian illusionsit but that didn’t stop me from pulling a number of posters, programs and photographs out of Egyptian Hall Museum and carrying them with me to Spain. I thought I would surprise them with a nice display. To make a long story short: there were two Changs. The man that I saw in my youth was Juan José Pablo Jesorum and he was indeed born in Panama on December 2, 1889. Early in his career he used the name Li Ho Chang, later shortening it to simply Chang. He enjoyed a very long career that took him to Australia, China, Africa, India, Europe and America but his greatest success came in Central and South America where he lived and worked most of his life. When I saw him in 1963 he was well past his prime at the age of 74. Being the first great illusionist I ever saw, my memories of him include gorgeous costumes, beautiful girls, well-trained assistants and huge illusions. Many years later, Milt Larsen told me the real behind-the-scenes story. Milt had been instructed to meet the Great Chang at the bus station in downtown Los Angeles. There he encountered an old man carrying two battered suit-cases. Milt looked around for the truck carrying Chang’s show. He soon learned that the suitcases were filled with costumes and a few tricks. That was the show. Springing into action, as he had so many times before, Milt rallied the forces. Bob Towner, Bob Fenton, Bev Bergeron and George Boston were enlisted as assistants and there were always plenty of pretty girls around the newly opened Magic Castle. Some illusions were trucked in from Dante’s ranch. Having spent his entire career presenting a full-evening show, Chang was in no way intimidated by the props and people that now swirled around him. His vast experience and abilities as a showman would serve him well. To a wide-eyed, thirteen-year-old kid, this master mystifier commanded the stage and did not disappoint. 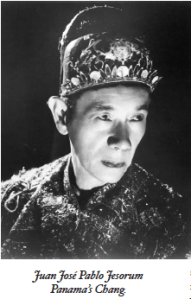 It would also appear that the majority of Li-Chang’s career was spent performing in Spain though he did make limited forays into France (at the Moulin Rouge in 1956), England (Bertram Mills Circus 1964), Italy, Portugal, Germany and North Africa. In 1947-48 Panama’s Chang was appearing in Barcelona, Spain and it was here that the two Changs finally met. Juan Pablo Jesorum was still performing at the age of 82 when he died in Yucatan, Mexico in 1972. Joan Forns died at age 81 in Barcelona, Spain on January 12, 1998. Before leaving Badalona I was given a full-color book published by the Badalona Museum in 2004 on the life of Joan Forns: Li-Chang. The text is written in Catalan (a language spoken in the northeast region of Spain) but it is filled with beautiful graphic images from througout Li-Chang’s long career. Returning home, I checked the usual sources (David Price, Milbourne Christopher) and found no refrence to Spain’s Li-Chang which led me to suspect that I was not the only one who believed in the one-Chang theory. Having recently examined a number of photos, programs, letters, Christmas cards, newspaper reviews and posters, I now believe that Panama’s Juan José Pablo Jesorum was always called Li Ho Chang early in his career and Chang later on. Spain’s Joan Forns always used the name Li-Chang. Egyptian Hall has a number of Li-Chang posters subtitled El Demonio Amarillo (The Yellow Demon). I always assumed that these advertised Panama’s Chang but I now believe that they were printed for Joan Forns in Spain (perhaps Valencia) in 1946. I would like to thank Enric Magoo for inviting us to Spain where this entire mystery was ultimately solved. And thanks also to Joan Maria Forns, son of Li-Chang, who spent years working as an assistant in his father’s show, for a wonderful evening of stories that brought another small piece of magic history into clearer focus.